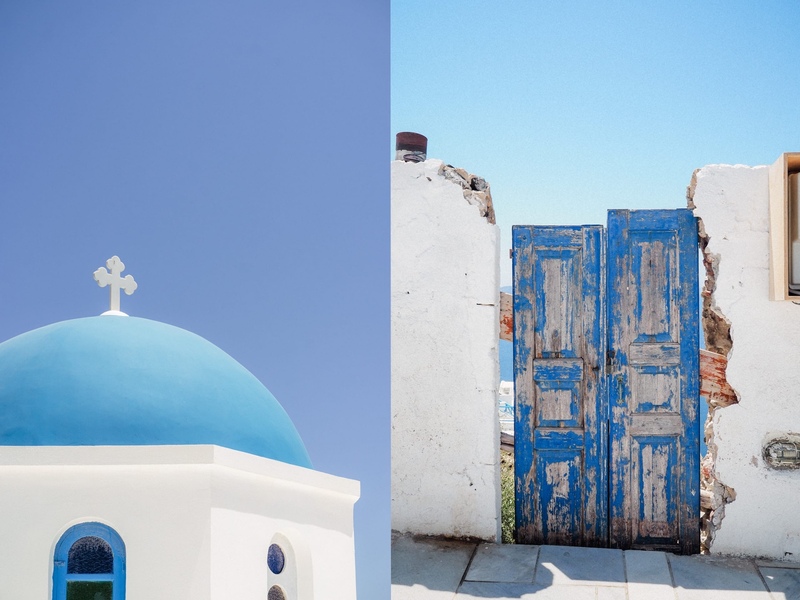 Blazing white architecture, blue dome churches, and shimmering seas — the Cyclades have it all. Around this time each year, without fail, I find myself booking flights and hotels in a foreign destination. 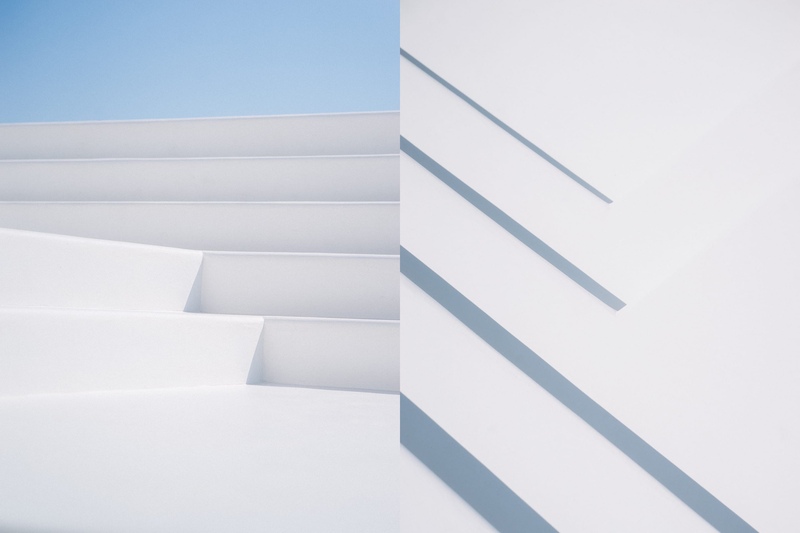 Generally, the inspiration comes from a photo I found on Instagram or a travel agent’s advertisement in a shop window at the mall. No matter where “there” is, it’s always more beautiful than “here”. This couldn’t be more perfectly embodied than the Greek Islands. Postcard photos of the group of islands that make up the Cyclades can be found just about anywhere. 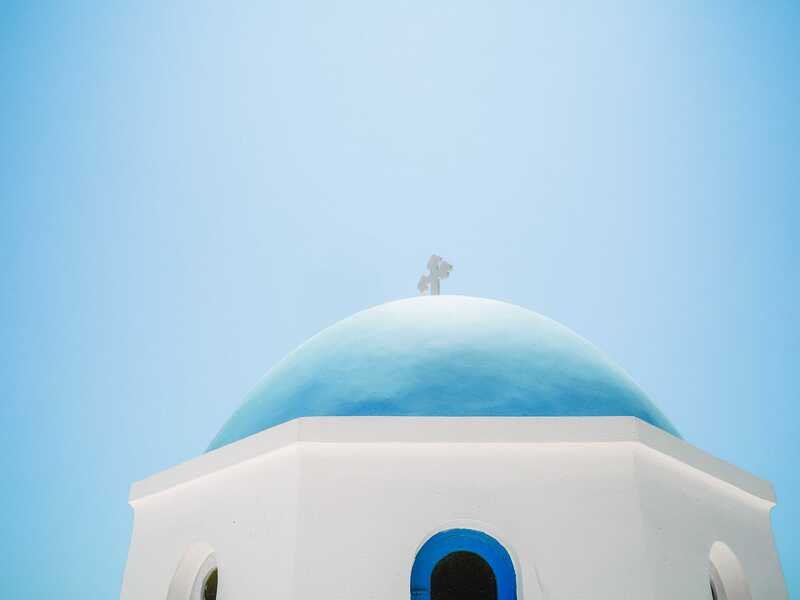 Blazing white architecture, blue dome churches, and shimmering seas — the Cyclades have it all. For the third leg of our trip last summer, my wife and I made our way to Mykonos and Santorini. Both islands have a honeymoon appeal, offering up a breadth of stunning views, surprisingly good cuisine, and unparalleled levels of luxury. 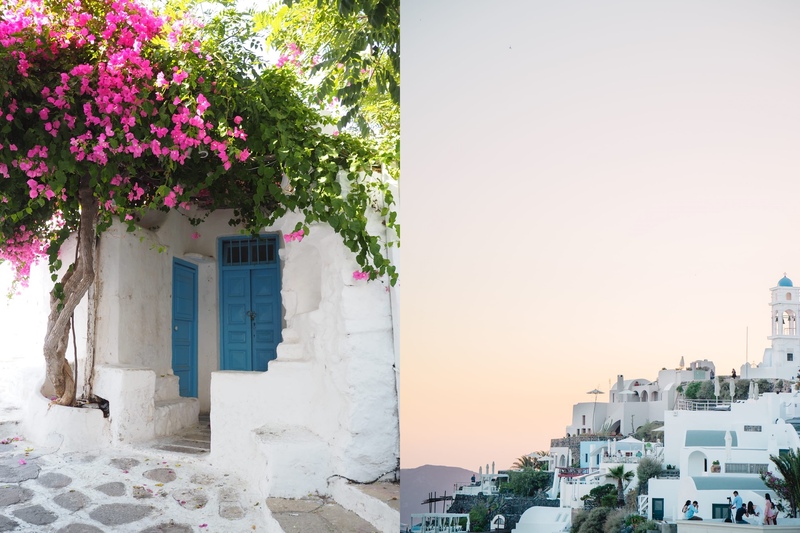 If you care to check out the first and second legs of our trip before diving into the wonders of the Cyclades, now’s your chance. 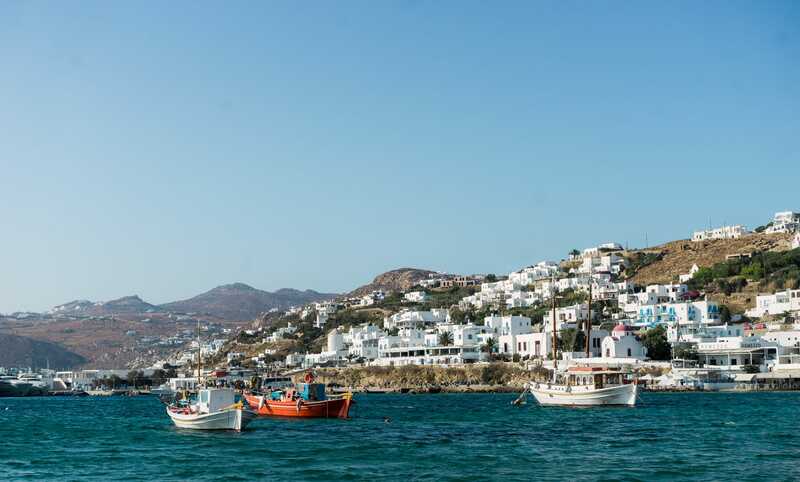 To the untrained eye, Mykonos might feel like a more “hands-on” version of Santorini, the more well-known Greek island. 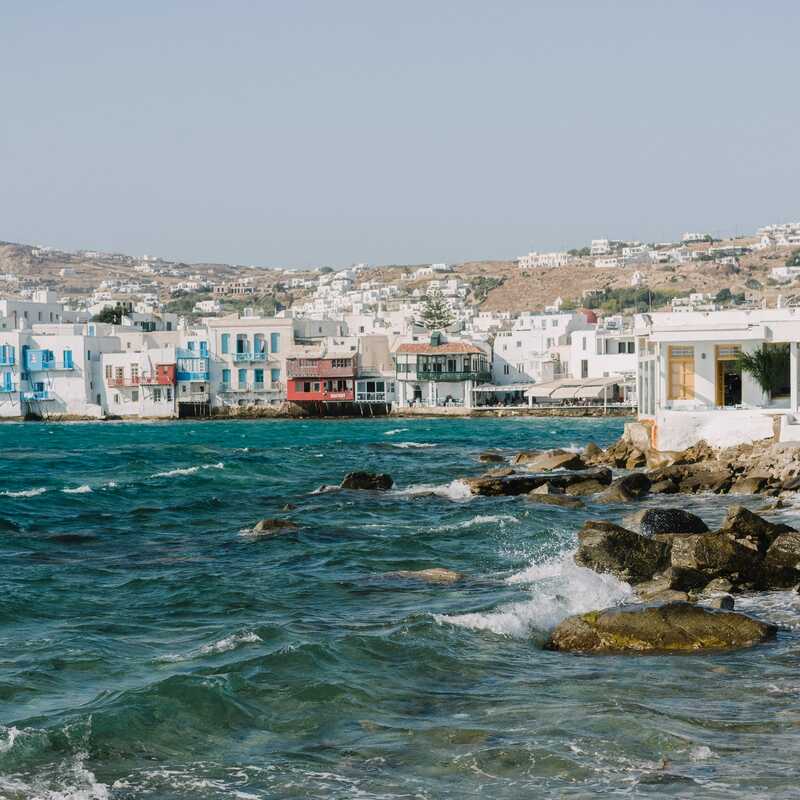 Mykonos and Mykonos Town are located on the sea — as opposed to being perched on top of a cliff — making the Cycladic winds windier and the ocean mist mistier. The whole town feels less pristine and more worn-in than those postcard photos would have you expect. But in reality, this is more likely an effect of the thousands of partying tourists making way through the cramped streets. Mykonos is, by and large, a party island. Late night beach dances never seem to end, nor does the roar of a thousand four-wheelers ripping through the streets. If you need further proof of Mykonos’ party island status, don’t look any further than the street signs — Paradise and Super Paradise beach are likely just around the corner. Due to our hiccup at an unnamed Spanish airport, we lost a day at our Myconian resort. I had planned to be able to say much more about Paradise and Super Paradise, but it’ll have to be after a trip in the future. Instead, during our single day in Mykonos, we stayed relatively confined to our resort. Petasos Beach Resort and Spa is located in its own little inlet on the beach of Platys Gialos (pronounced “plat-ees yalose”), making it a perfect spot for rest and relaxation. The resort had its own private beach where we could jump off the rocks into the clear Mediterranean water, and the deck had a wonderful salt water pool with endless concierge service. The late-evening dinner was an incredible voyage through Greek cuisine — well worth the near €100 price tag. 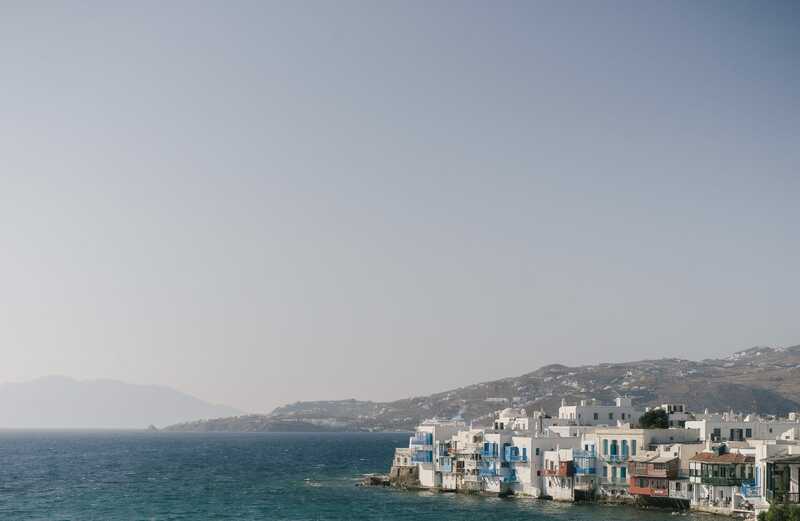 In all, Mykonos was a wonderful introduction to what the Greek Cyclades had to offer. 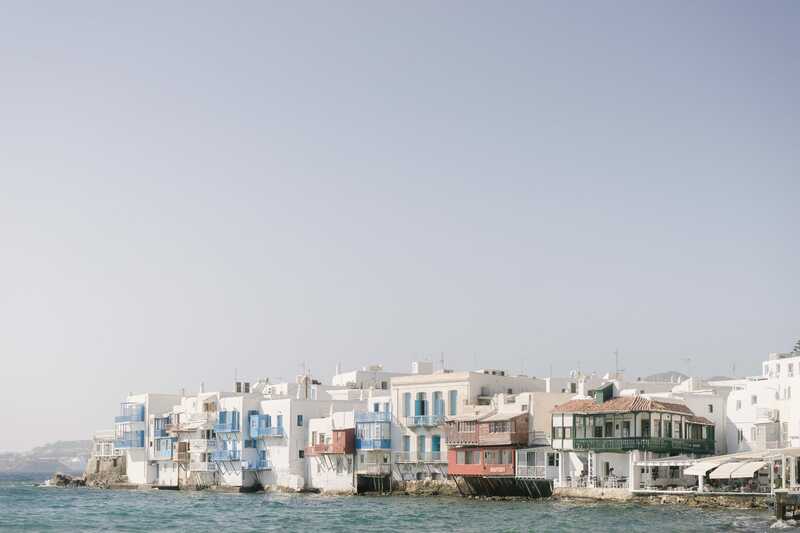 Mykonos Town is wind-swept and dusty, but full of charm and character. 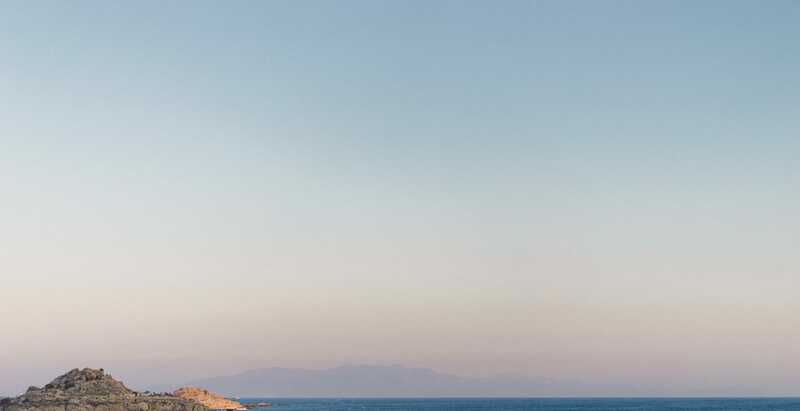 The classic Myconian windmills can be found up on the hill, in perfect position to take advantage of the strong Cycladic winds. And Little Venice handles the crashing Aegean waves like it has for a few thousand years. Between the intense Greek sun and equally intense Greek beer, we were well on our way to enjoying everything the Cyclades had to offer. 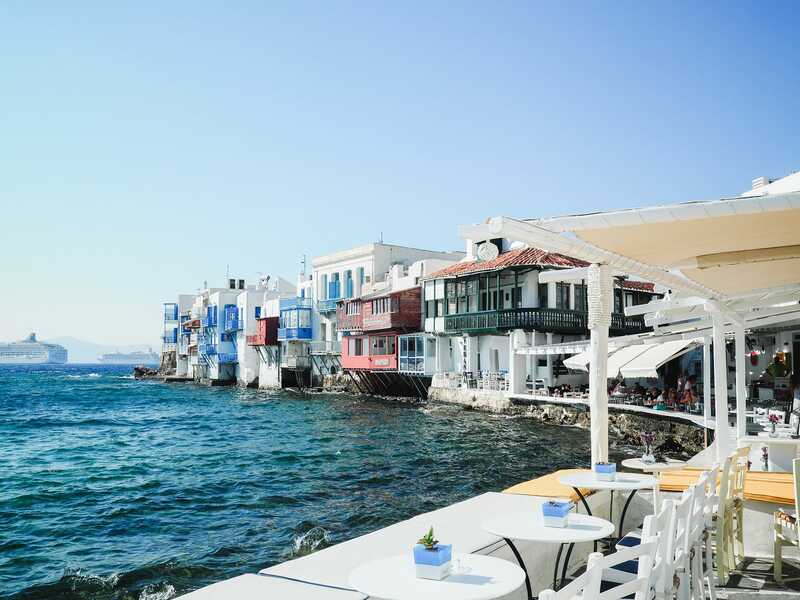 In reality though, when one thinks of the Greek Islands, they never think of Mykonos. 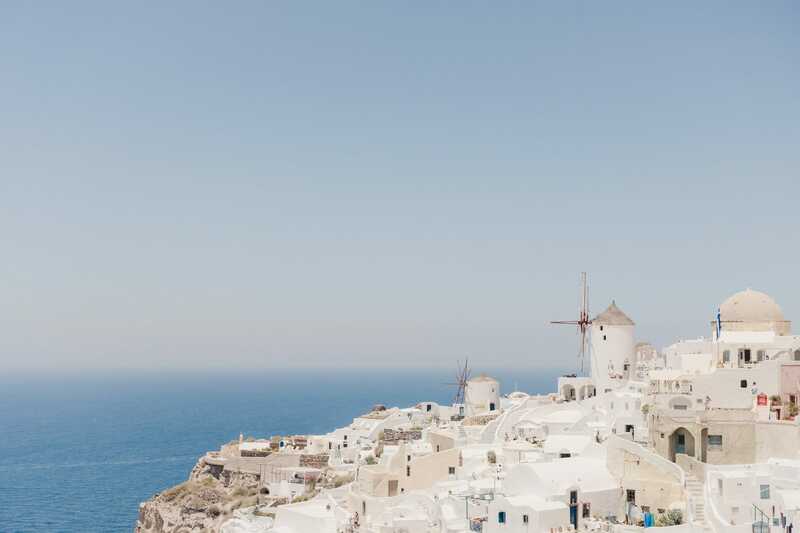 The cliffhanging view of the caldera, the striking blue-domed churches, the white and grey steps ending at the edge of the sea — those experiences can only be found in Santorini. 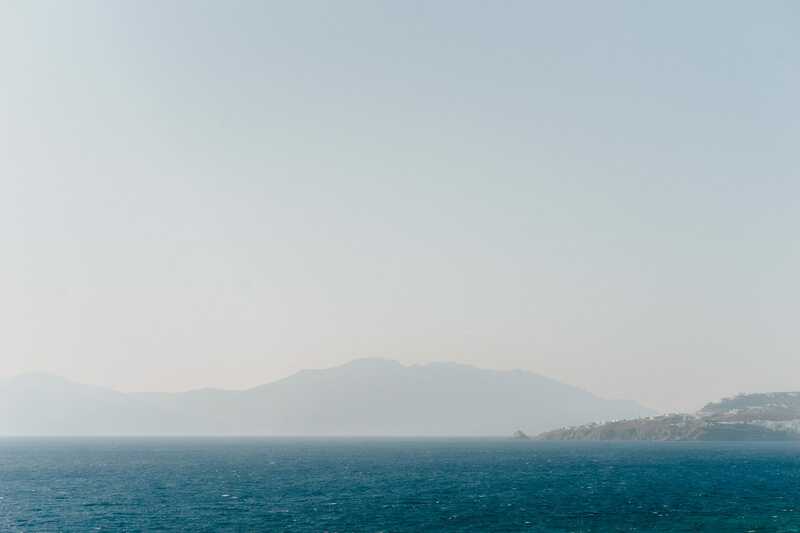 A three hour ferry ride from Mykonos, the island of Santorini is what dreams are made of. Figuratively and literally – there were more wedding dresses in the streets of Santorini than I’ve seen in a dress shop. 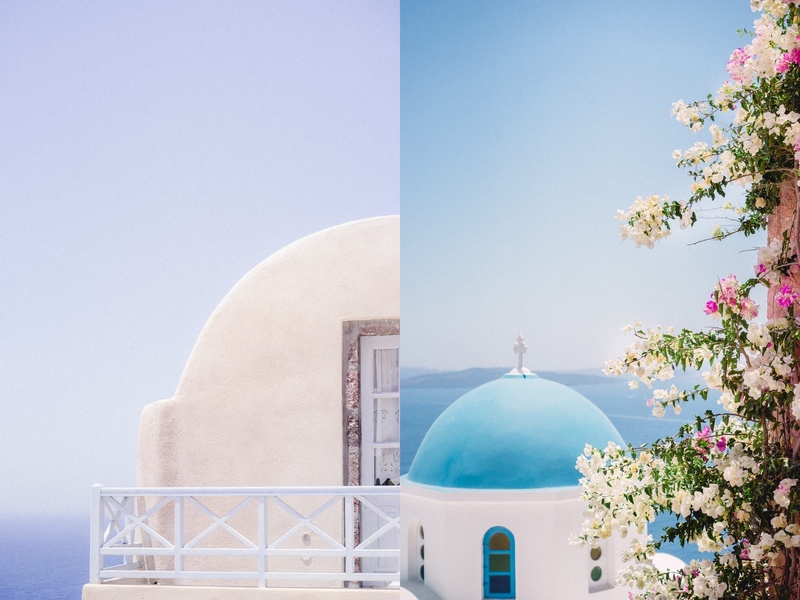 Santorini is one of the most sought after locations for destination weddings and surely ranks near the top of most coveted honeymoon destinations. And, of course, for good reason. There is truly no view like the sunset view at Katina’s in Amoudi Bay. If you want to get the full experience, be sure to have your hotel book you a reservation at a table along the water — the restaurant sells out hours ahead of time. 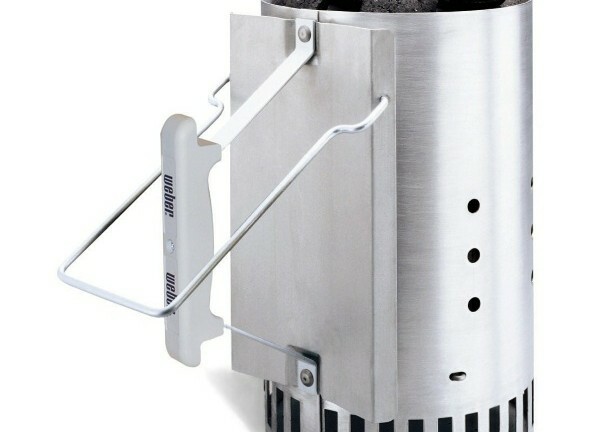 The caldera won’t be outdone, mind you. No matter where you are on the island, the view of the caldera is nothing short of spectacular. 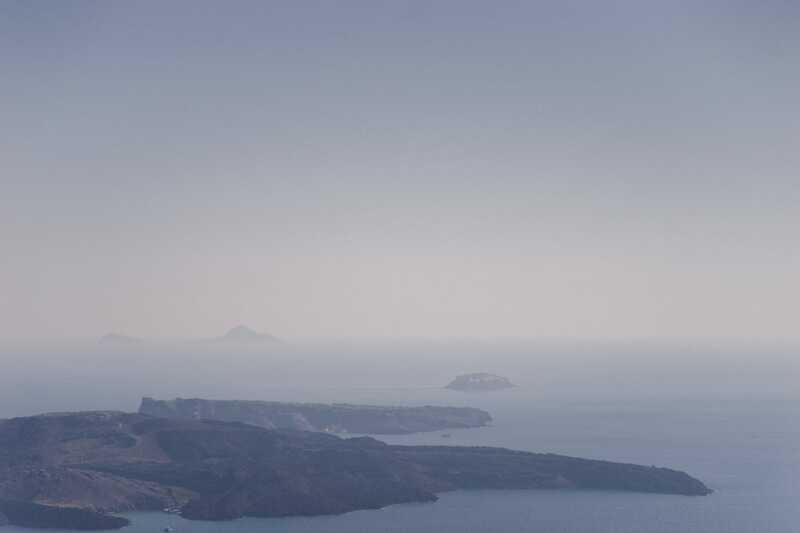 Even a winding hike from Imerovigli to Oia can’t leave the caldera in the dust. From your hotel balcony, it feels like you can reach out and touch the caldera or pick up any of the cruise ships treading water below. 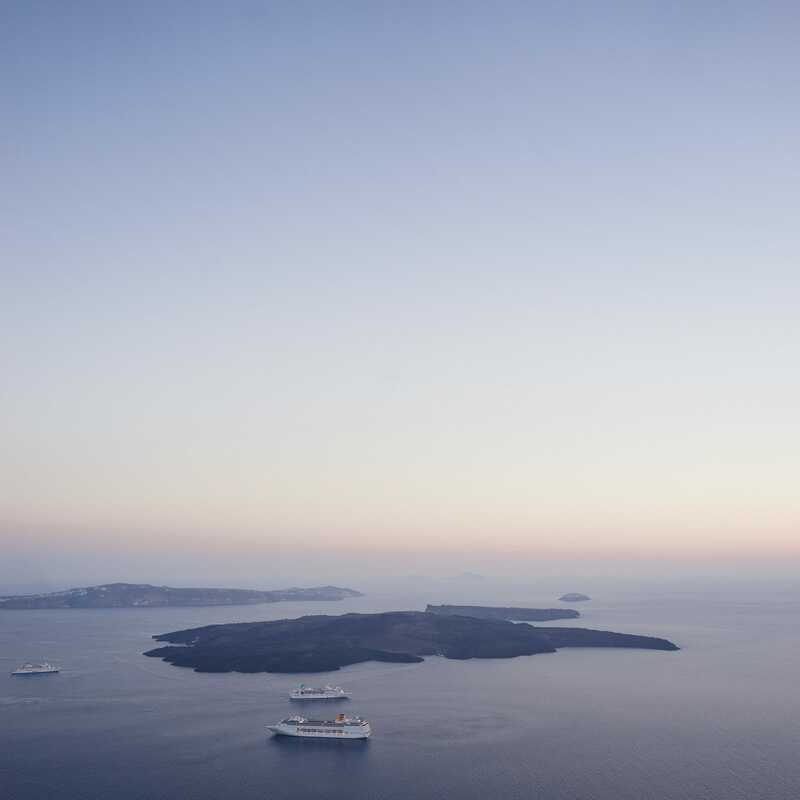 Those cruise ships are a dime a dozen in Santorini. Ferries and cruise ships transport in droves of tourists, while those same tourists clog up Thira’s airport on the way out. If there is any one aspect standing in the way of Santorini being the most beautiful place on Planet Earth, it may be the tourists. Or, mind you, the price. All that beauty comes at a cost. 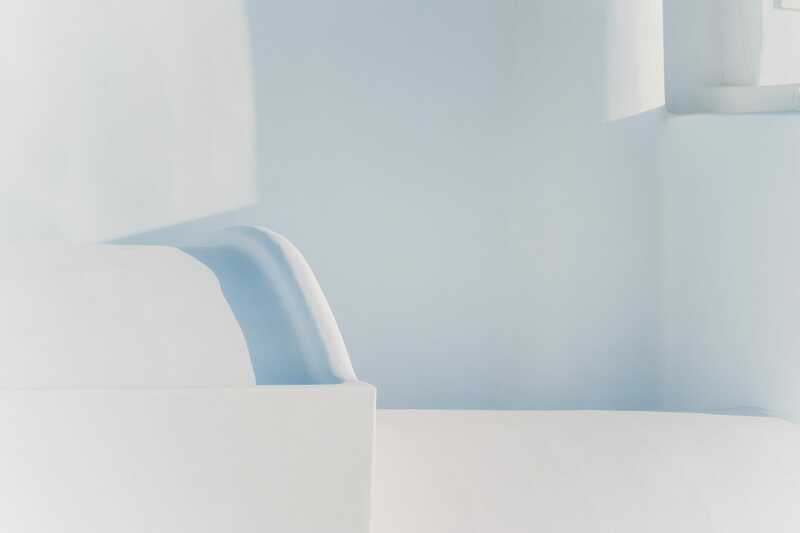 So while Grace Santorini may make its way onto a list of the world’s greatest hotels, the $1000+ per night price tag and corresponding dress code may have you up in arms. Even our three-star hotel rang in at $450+ per night. Here’s the thing though: In Santorini, your choice of hotel will largely govern your experience. Stay in the wrong village and the trek to Oia for a sunset view becomes more difficult. Stay on the wrong side of the island and you don’t get to see the caldera. 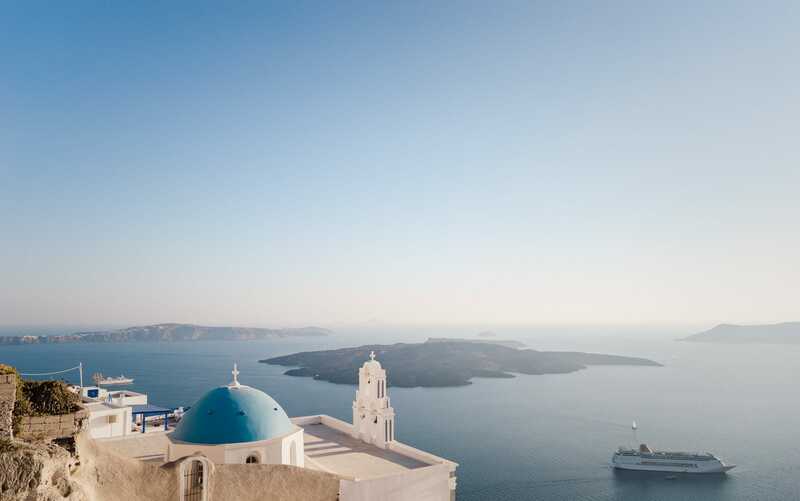 If there is one thing to nail in the planning stages of a Santorini trip, it’s the hotel. 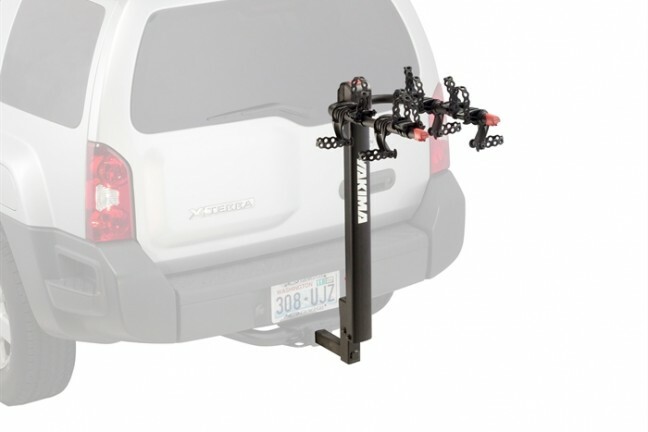 Save dollars in other places and you’ll thank yourself later. 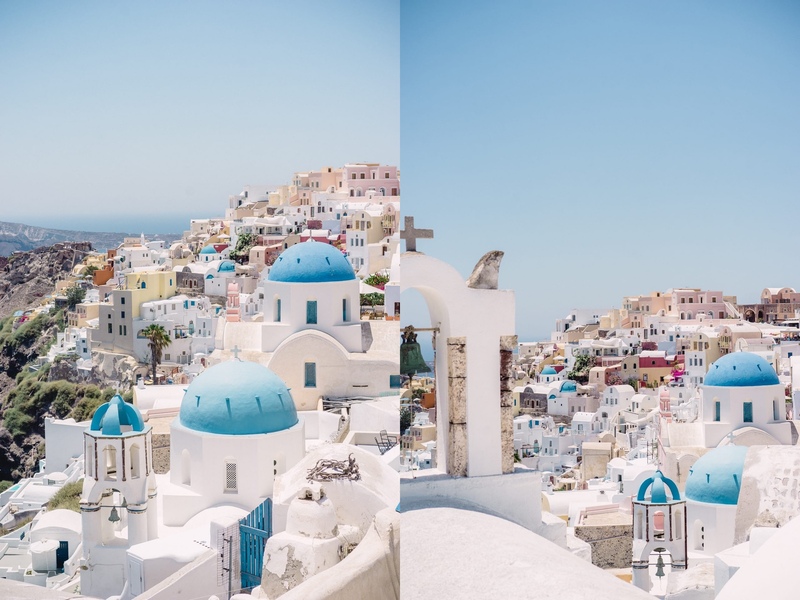 After puckering up to the bill and after succumbing to the blazing Greek heat, it’s hard not to have ethereal adjectives to describe Santorini. Even after seeing postcards, the view is something to behold. After starring photos on Flickr, the sunset is more colorful than expected. The moment you step out of the vehicle after your climb up the cliff, you realize you’re on a literal Cloud 9. 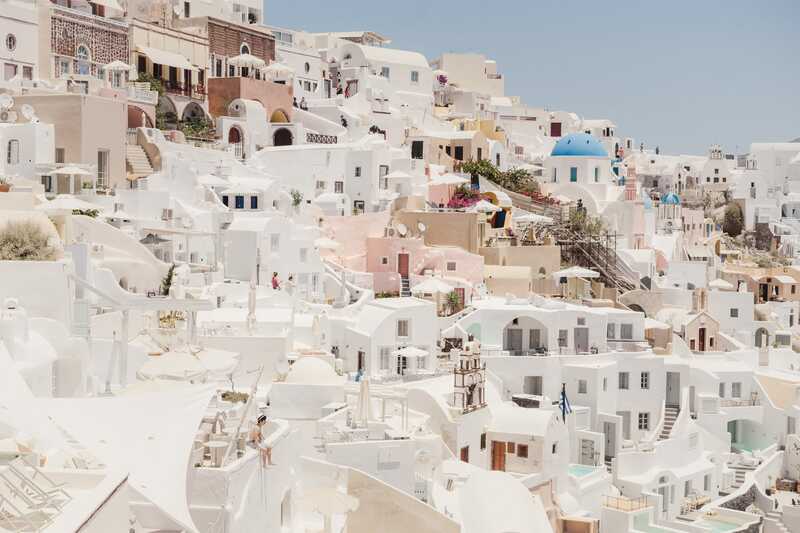 Of all the places we visited during our three week trip, Santorini sits atop our list of most recommended destinations to visit. Our trip was full of ups and downs, and Santorini was the ultimate way to top it off. Admittedly, I’ve overshared the images in this three-part “Backpacking Europe” series. You’ve likely seen a few of these photos scattered on Instagram or in prior reviews. 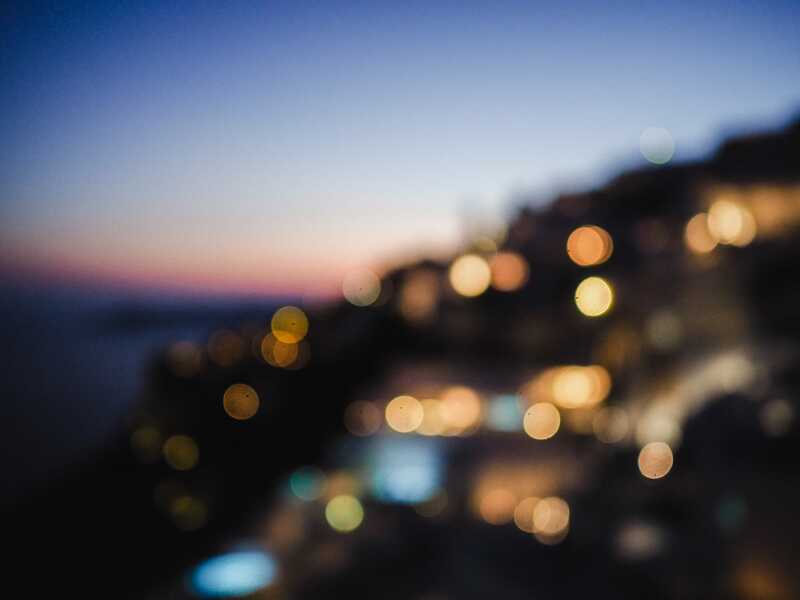 Even still, I hope some travel photography at the beginning of travel season will inspire you to venture away from home over the next few months. The world is an incredibly large place, full of whimsy and cheer in parts, and perhaps not so much in others. Ignore Twitter. Ignore the news. Step out the front door and go see something new this summer. Cameras: Sony a7 II + Olympus OM-D E-M5 Mark II. Lenses: Sony 55mm f/1.8 Sonnar T + Zeiss Batis 85mm f/1.8 + Zeiss Batis 25mm f/2 + Panasonic Leica DG Summilux 15mm f/1.7.